The island of Capri is one of the most picturesque and most visited in Tirrhenian sea. Capri – a luxurious and unforgettable island, with its fragrant gardens and mild climate, for centuries attracted intellectuals, artists and writers, who were delighted with its magical beauty. Capri is a symbol of “Dolce Vita”. The mixture of history, nature, life, culture, and daily events gave rise to many myths and legends that are closely intertwined. 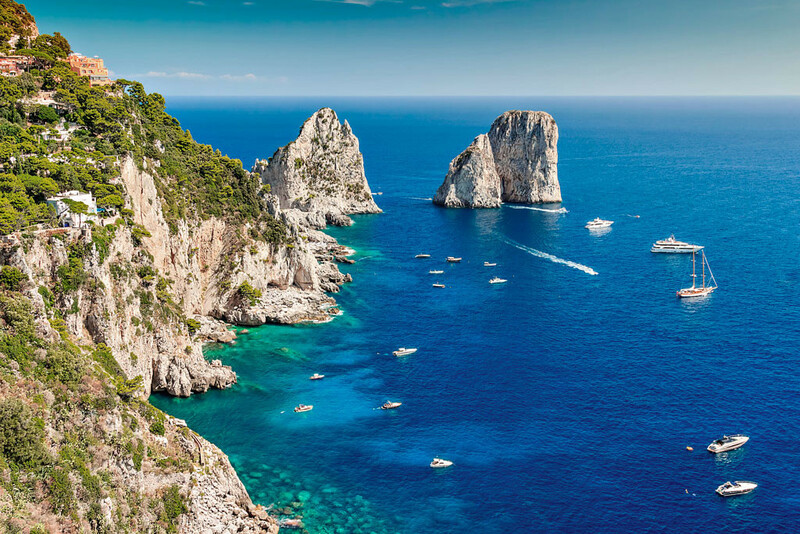 Capri is the only island in the Bay of Naples, which doesn’t have a volcanic origin, formed by a huge limestone rock, which eventually gave its present relief with its main area – Anacapri. The sea, from the depths of which the magnificent cliffs were majestically born, with many beautiful caves, among which the most famous is its pearl – Blue Grotto, which was found in the times of the Roman Empire. Emperors used the cave entrance, often hidden by tides, as its own swimming pool. The most striking is a view from the sea on the famous cliffs, small rocky islets variegated forms which arise from the deep azure waters.